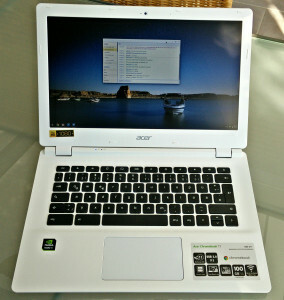 Today, I received my Acer Chromebook 13, in the glorious FullHD variant with 4GB RAM. For those of you who don’t know it, the Acer Chromebook 13 is a 13.3 inch chromebook powered by a Tegra K1 cpu. This version cannot be ordered currently, only pre-orders were shipped yesterday (at least here in Germany). I cannot even review it on Amazon (despite having it bought there), as they have not enabled reviews for it yet. The device feels solidly built, and looks good. It comes in all-white matte plastic and is slightly reminiscent of the old white MacBooks. The keyboard is horrible, there’s no well defined pressure point. It feels like your typing on a pillow. The display is OK, an IPS would be a lot nicer to work with, though. Oh, and it could be brighter. I do not think that using it outside on a sunny day would be a good idea. The speakers are loud and clear compared to my ThinkPad X230. The performance of the device is about acceptable (unfortunately, I do not have any comparison in this device class). Even when typing this blog post in the visual wordpress editor, I notice some sluggishness. Opening the app launcher or loading the new tab page while music is playing makes the music stop for or skip a few ms (20-50ms if I had to guess). Running a benchmark in parallel or browsing does not usually cause this stuttering, though. There are still some bugs in Chrome OS: Loading the Play Books library the first time resulted in some rendering issues. The “Browser” process always consumes at least 10% CPU, even when idling, with no page open; this might cause some of the sluggishness I mentioned above. Also watching Flash videos used more CPU than I expected given that it is hardware accelerated. Finally, Netflix did not work out of the box, despite the Chromebook shipping with a special Netflix plugin. I always get some unexpected issue-type page. Setting the user agent to Chrome 38 from Windows, thus forcing the use of the EME video player instead of the Netflix plugin, makes it work. I reported these software issues to Google via Alt+Shift+I. The issues appeared on the current version of the stable channel, 37.0.2062.120. What’s next? I don’t know.